At Windy City Harvest Youth Farm, our young workers are exposed to nutrition in ways that relate directly to their work. As the season progresses, new crops are harvested and introduced to our staff. A lot of these are vegetables they have never eaten or seen before. They grow easily and can be used in many dishes. Scallions, or green onions, are never the centerpiece of a meal. They are pungent and crisp, and most often are used as a garnish or topping. 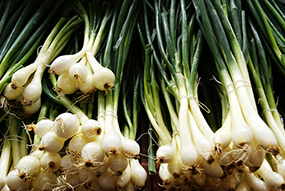 Scallions are a part of the allium family, meaning it can call the garlic, onion, and leek its brothers and sisters. Like other alliums, scallions contain special properties like organosulfur compounds and allyl sulfides, as well as thiosulfinates. Those are complicated words, but what they mean is that these compounds are being studied for their effects on blood pressure, cholesterol, and cancer. Most importantly, they taste great on everything from mashed sweet potatoes to chicken tacos. The nutritional reputation of potatoes has suffered due to their high carbohydrate content. However, potatoes can be very nutritious. An especially nutritious potato variety is the purple potato. 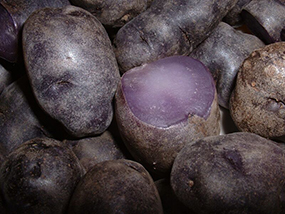 Purple potatoes taste like other potatoes, but they have an undeniable rich purple color. This is because they are abundant in the antioxidant flavonoid anthocyanin. This is the same flavonoid, or plant pigment, that colors blueberries and pomegranates. Here’s how antioxidants are thought to work: Reactive and unstable molecules called free radicals enter our bodies when we inhale cigarette smoke, breathe polluted air, or even eat an unhealthy diet. Antioxidants bind to them and make them less reactive. Purple potatoes also contain high amounts of of potassium, even more than bananas. Potassium is important to counteract the effects of a high-sodium diet. Purple potatoes are a welcome upgrade from the common russet potato. Just don’t deep fry them. Red bell peppers can be crisp and crunchy when raw or savory and sweet when cooked. Green bells are not a unique variety of pepper. They are the same variety as red peppers, but they are picked before ripening. When you let this vegetable ripen to its full potential, the nutrient content increases. Ripening bell peppers turn from green to red. Red bell peppers are best known for their powerful antioxidant properties. Just one pepper contains twice the daily requirement for Vitamin C, making bell peppers one of the richest foods for Vitamin C. Vitamin C helps grow and repair tissues in the body and helps the body absorb iron. The Vitamin A content comes in at a close second in this sweet pepper. Vitamin A is essential for healthy eyes, skin, and neurological function. One pepper gives you about three-fourths of your daily Vitamin A needs. 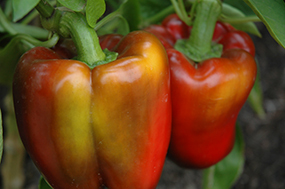 Red bell peppers also feature their own flavonoid antioxidant. Just like the purple potatoes, this antioxidant is responsible for the vegetables’ brilliant red color. A colorful plate is truly a healthy plate. At Windy City Harvest Youth Farm, we harvest something seasonal and fresh every week. And every week we harvest something healthy. If you are interested in trying scallions, purple potatoes, or red peppers while meeting our bright youth, come visit Windy City Harvest at our community markets. 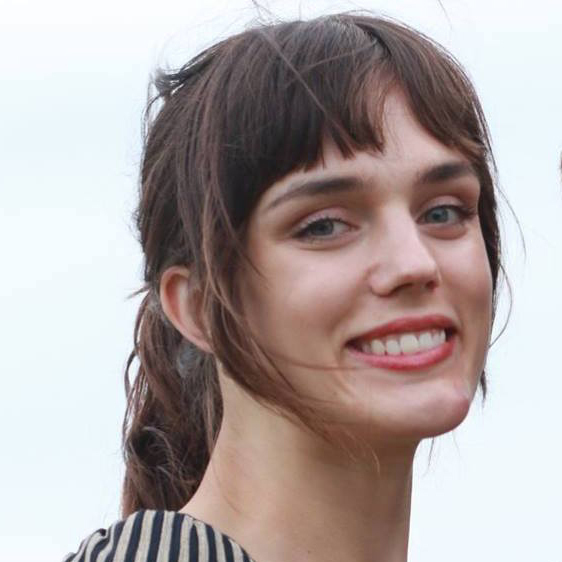 Demi Maropoulos is a bachelor of science student in the Coordinated Nutrition Program at University of Illinois at Chicago (UIC). Demi is in the midst of completing her supervised practice hours in order to become a registered dietitian. Cooking, gardening, and farming is what brought Demi to the profession of dietetics, so it is only fitting that she worked with Windy City Harvest for her community nutrition internship. Thank you to Conagra Brands Foundation for supporting Windy City Harvest Youth Farm’s healthy eating initiative.